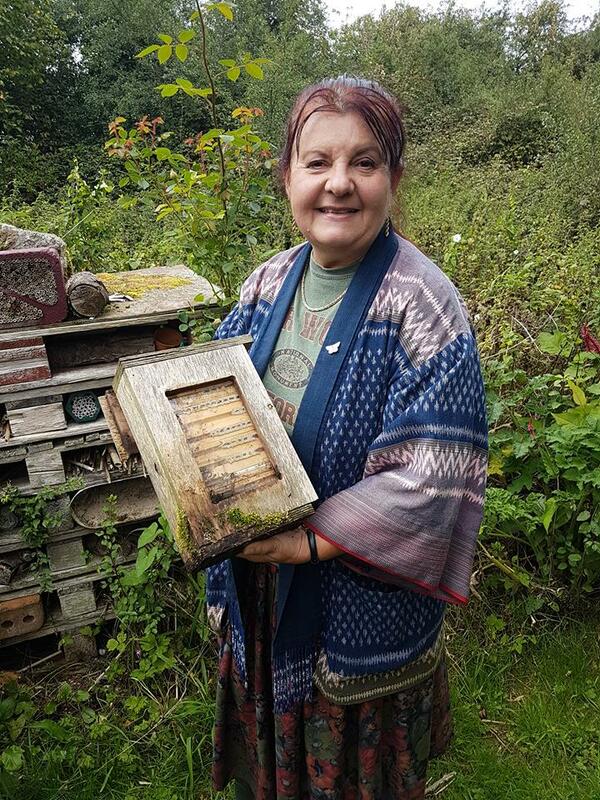 Jan Miller runs Saith Ffynnon Wildlife Plants from her home near Holywell—a business that specialises in wild seeds and plants, including those native to the UK, that are useful to wildlife. At her home, a former farm, naturalist Jan grows plants and flowers in her garden and collects and packages the seeds, which she then sells on her website. Jan also sells plants, and around 10% of her profit is given to local conservation projects. But Jan has a particular interest in the conservation of insects, butterflies, and bees. She has grown several species of native wild plants and garden plants, including eupatorium, a flower which produces nectar that attracts butterflies and bumblebees. Indeed, her garden is thriving with hundreds of native species, including many flowers such as Foxglove, Bird’s Foot Trefoil, Knapweed, and Red Clover, all of which are vital to some of the UK’s 250 species of bees. Jan explained how she got started with her meadow, which she has developed over thirty years. “I was interested in wildflowers many years back, and when we first got the chance to move here in the early eighties, they were talking about all the wildflower meadows dying out, and I principally wanted some land to have a wildflower meadow on,” she said. Jan has four fields surrounding her home and chooses to cut the grass no more than every other year or even every third or fourth. By doing this, the old grass falls and the new grass grows upward, creating a thatch. This was so that butterflies that need to overwinter in dead grass stems would survive. But unknowingly, this environment has also attracted voles and consequently barn owls! Jan has also built ‘bug towers’ from stacks of wood pallets that attract many insects to her meadow. Jan explained why wild meadow conservation was important to her and backed Wales Horticulture’s campaign to establish horticulture clusters of businesses across the country, helping like-minded people network and collectively promote each other. “We’ve lost 98% of our wildflower meadows in Wales and the UK since the war. We are losing butterflies and pollinating insects at an alarming rate. That has an impact on our own food and other wildlife. “It’s urgent that we do something, and that is why I’m passionate about doing this. What I enjoy is showing people the habitats I create; it’s difficult to make a living because I don’t get enough publicity. But the issue is getting more notice now. There is a huge interest in wildlife, and more people are getting interested in this market. Jan has published her book Gardening for Butterflies, Bees, and other Beneficial Insects, which is available on Amazon or from her website.